Watch this page for more Long Island, NY event dates. endorsed by the Association of Personal Historians. HERE YOU'LL READ ABOUT ALL THE GREAT ITEMS THAT WERE SHARED AT THE 11/5/2013 SHOW & TELL EVENT... We were happy to have Carole of Hicksville join us in October and again in November. This time she showed a piece of pottery she purchased for $10 at a thrift shop. Having studied art in Paris, Carole saw this item and HAD to purchase it (yes, “purchase”). She was so intrigued by it. Shortly after showing this to her neighbor, the neighbor found an article illustrating Mayan era pottery. 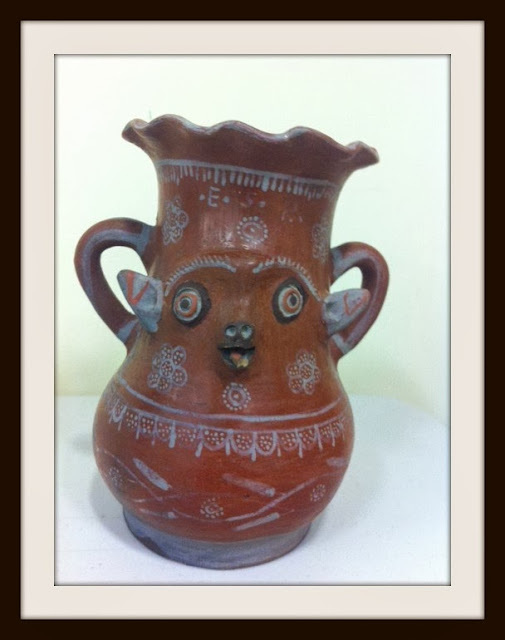 The pottery depicted in the article looked surprisingly similar to Carole’s just-purchased pottery. When the Antiques Roadshow comes to town, Carole is sure they’ll announce this item is worth millions of dollars! In all seriousness, when visiting the Museum of Natural History and viewing ancient Mayan artifacts, this item would fit right in with the stunning pieces, inasmuch as out of its element it looks as though it’s made by a child. (You’ve got to admit, it does look a lot like the piece illustrated in the article pictured below.) And yes, to my surprise, she really did pay $10 for it! Evelyn of St. James brought a picture of herself at about five years old. Also pictured are her mom and dad. (Her dad was 17 years older than her mom.) This photograph hangs on the wall in Evelyn’s bedroom. She laughingly reminisced about both her grandmothers: “Uma” (her maternal grandmother) and “Other Uma” (her paternal grandmother). She recalls visiting Uma’s house every Saturday morning. Uma would make pot roast and they would eat the fat with fried onions on challah bread. She can still remember the wonderful taste. At Thanksgiving her Uma would make goose and schmear the grease on challah bread. Evelyn grew up on 161st Street and Riverside Drive (at that time known at Washington Heights). She remembers the day she met "Dr. Ruth" on the High Holiday at temple. She also recalls having to learn German in order to speak with Other Uma, who didn’t speak English. Evelyn would take the #3 train to 193rd Street to visit Other Uma. She has a vivid memory of Other Uma’s hair, which appeared all white when worn bundled up in a braid. But when Other Uma took out her braided bun, her hair reached all the way down to the floor and was all different colors, as it has changed colors through the decades. Evelyn used to wonder how Other Uma was able to hold her head up with the weight of all that hair. (Evelyn’s mother is now 98 years old and is living in a nursing home. Evelyn visits her dear mother often.) After struggling to become pregnant, Ronnie of Farmingdale was blessed with a son. Shortly afterwards, she was thrilled to discover she was again pregnant. Two sonograms later, the doctor made a surprise announcement that Ronnie and her husband would be having twin daughters. Ronnie was thrilled to see the sonogram image. She shared with us the image, which appears to be two sweet teddy bears side by side. It’s not every day you see a sonogram image of twins. Ronnie and her husband love being mom and dad to their three children: their son and twin daughters. Their home is full of love, laughter and activity! Barbara of St. James joined us in October, and we were happy to have her join us again for our November event. This time she brought with her an item that has special significance. She and her husband, Pat, visited Egypt one year. On that trip Pat bought Barbara a cartouche necklace with her name on it. A cartouche is an oval with a horizontal line at one end, indicating that the text enclosed is a royal name. Cartouches were formerly only worn by Pharaohs. The oval surrounding their name was meant to protect them from evil spirits in life and after death. The cartouche has become a symbol representing good luck and protection from evil. Barbara wears her cartouche often, with fond memories of that special trip. Barbara also shared a photograph taken during that trip of a re-enactment of ancient Egyptian times. Each participant was assigned a character from history. Barbara and Pat are pictured here as a Pharaoh and harem girl. (The photo commentary was added years later for a birthday celebration for Pat.) Cheryle Ann of Staten Island shared with us meticulously-compiled family history books (one with details dating back to the 1600s), a family collaboration, complete with photographs, family stories, telegrams, locations of cemetery plots, dates and places of birth, newspaper articles (yes there were some skeletons in the closet…maybe an abandonment or two, but we’re not telling!). We enjoyed hearing how the family worked together on this project. Of special importance was a message left at the back of the book…a note to the Next Generation. Kudos to Cheryle Ann and family for this special gift to their descendants. Rochelle joined us from St. James. Rochelle’s father was born in Vilna (at the time part of Lithuania, later part of Russia). He came to America in 1917. Rochelle shared a picture of her father at four years old, along with his 8-year-old brother Robert. (Notice the Rasputin look on brother Robert, a common look during that era.) Rochelle’s father made notes (in Cyrillic) on the back of the photograph. Rochelle recalls stories her father told of her wealthy grandfather. She learned how Cossacks would come in to any home they wanted, and take whatever they wanted: silver service, artwork, money. The citizens would give up their possessions in the hopes they wouldn’t be killed. Rochelle’s grandfather spoke numerous languages. He was able to secure passage for his family, with a sponsorship by his brother (already in America). They left Russia as the war was nearing an end. En route, the German’s threatened to bomb the boat, so it was rerouted to Rotterdam. The family finally made their way to America. Rochelle showed us the family photograph that was taken the very day her dad and family left for passage to America. Her dad told stories about people lining up at Ellis Island. Those passengers who were ill had a marking made on their sleeve indicating they were to be sent back to their homeland. Both ill and healthy people were switching coats with each other in order to either stay in America or be sent home. When it came time to be cleared, names often were changed. Rochelle’s dad was born “Sasha Rudinski.” When “cleared,” his papers were marked (and he was renamed) “Charles Rudin.” Rochelle’s dad passed away at age 91 in 1996. The items Rochelle shared with us were in pristine condition, having survived nearly a century. Holding them we were able to feel the emotions of her family in those very early years. Rochelle also showed us the American flag that her dad and his family were presented with when they arrived at Ellis Island in 1917 (notice the 48 stars). Rochelle’s dad’s name is proudly inscribed on the wall at Ellis Island. Our very first Show & Tell event was held on Tuesday, October 1, 2013 at the Smithtown Library, Commack Branch, 3 Indian Head Road, Commack, NY. These are the wonderful items participants brought and shared with us. Enjoy! Thea of Farmingdale showed a book she had purchased at an estate sale for $3. 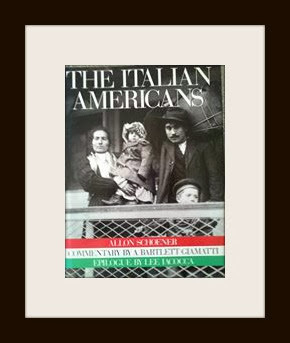 Something compelled her to buy this particular book, "The Italian Americans." She dropped the book off at her parents’ home; surely they would enjoy it. As they flipped through it, they were astonished when they turned to a page and saw Thea’s dad’s face smiling back at them from the printed pages of the book. They had no idea that this photograph was ever included in this very special book. Carole of Hicksville shared meticulously-organized scrapbooks containing her family’s cherished history. Of particular interest was her great grandparents’ ornate wedding announcement from the late 1800s. The books contain newspaper articles, ticket stubs, handwritten notes, countless photographs, and much more; a tribute to her ancestors and a treasure for generations to come. Dale of St. James remembered a time his older sister was left to babysit him one evening. He kept trying to sneak out of the house. One door, then another, then another. But dear sis was much too sly for him; she caught him every time. Finally he made it out! But sis locked all the doors to the house and would not let him back in. Dale’s parents came home around midnight to find him sitting out on the front steps. (Sadly, Dale's sister -- his only sibling -- passed away a few months ago. But she was surely smiling down on him while he shared this story with us at our Show & Tell.) Janet from Smithtown vividly remembers times spent with her dad, particularly a special day in the mid ‘60s when they went together to see Man of La Mancha on Broadway. Each morning after that, her dad sang The Impossible Dream. They also saw The Sound of Music together. That day became extra special after Mary Martin (the lead actress) paused as she walked by Janet and commented, “Oh, you look lovely in that dress.” Kathy from St. James told of her childhood, attending the yearly Feast of San Gennaro on Mulberry Street (NYC). For Kathy a highlight of the feast was watching the greasy-pole-climbing contest which would take place on the corner of Hester Street and Mulberry Street. Contestants attempted to climb a three-story-tall pole covered in automotive oil. Kathy would watch the feast while sitting on the fire escape of her grandmother’s home at 188 Hester. (The greasy pole contest was a part of the feast festivities until mid-‘70s.) Barbara from St. James showed a lovingly designed personalized calendar from 1998 that she gave to her husband as a Christmas gift. Each year Barbara and her husband take a special trip to celebrate their wedding anniversary. Every month of the personalized calendar displayed a photograph taken while on one of those trips. (Barbara and her husband will celebrate their 56th wedding anniversary this November.) Maryanne of Commack showed a 1950s photograph of her dad and two of his pals on the beach in their swim trunks. Everyone chuckled about how style has changed. Maryanne comes from a huge family with Greek roots. Her paternal grandfather was the first of their family to come to America from Greece, although many family members remain in Greece to this day. It’s remarkable to see family resemblances in pictures of relatives living in both Greece and America who have not yet met. Maryanne’s dad is 82 years old now. Deborah from Commack (that's me!) showed her maternal grandmother’s sheet music. Throughout the ‘20s & ‘30s, her grandmother was a professional singer at the Rustic Cabin in Englewood Cliffs, New Jersey. WNEW Radio would broadcast shows from there. Her grandmother often spoke about a talented singing waiter whose name was Frank Sinatra (before he was discovered by Harry James).